A proposed rule change for the use of federal Housing Choice Vouchers would greatly improve the chance that housing vouchers will do what they are supposed to do: Provide low income families with a choice in where they want to live. The U.S. Department of Housing and Urban Development (HUD) announced a new rule to change the formula determining how much rent a housing voucher will cover. Currently voucher holders, the great majority of whom are African-Americans and other people of color, are highly concentrated in low income, racially segregated neighborhoods – often the only areas where the value of a voucher meets the cost of rent, or where landlords are less likely to discriminate against people with vouchers. In these areas where HUD data shows “there is a wide variance in the rents being charged to tenants and where voucher holders are concentrated in a few high-poverty neighborhoods,” HUD would require local housing authorities to use Small Area Fair Market Rent (SAFMR) calculations to set different maximum allowable voucher rent levels by zip code. Right now, most vouchers are pinned to an area’s Fair Market Rent, which HUD determines as the standard payment amount for each metropolitan area or county. By narrowing the scope of allowable rents to individual zip codes, SAFMRs allow for higher rents in more expensive areas and lower subsidies in less affluent areas. To use Dallas as an example: With Fair Market Rent levels from 2015, the rule change would set a voucher subsidy for a one-bedroom apartment in the 75203 zip code south of downtown, one of the lowest-income areas in the city, at just $550 per month. But it would essentially double the monthly subsidy for a one-bedroom in the affluent 75225 zip code in north Dallas, at $1,090. The proposed change now enters a 60-day public comment period and, if ultimately enacted, would dramatically improve housing options for voucher holders in 31 metropolitan regions, including three in Texas: Dallas-Plano-Irving, Fort Worth-Arlington and San Antonio-New Braunfels. The current voucher program leaves its users, who are predominantly African-American and Hispanic, without much choice but to live in racially segregated, low opportunity neighborhoods. 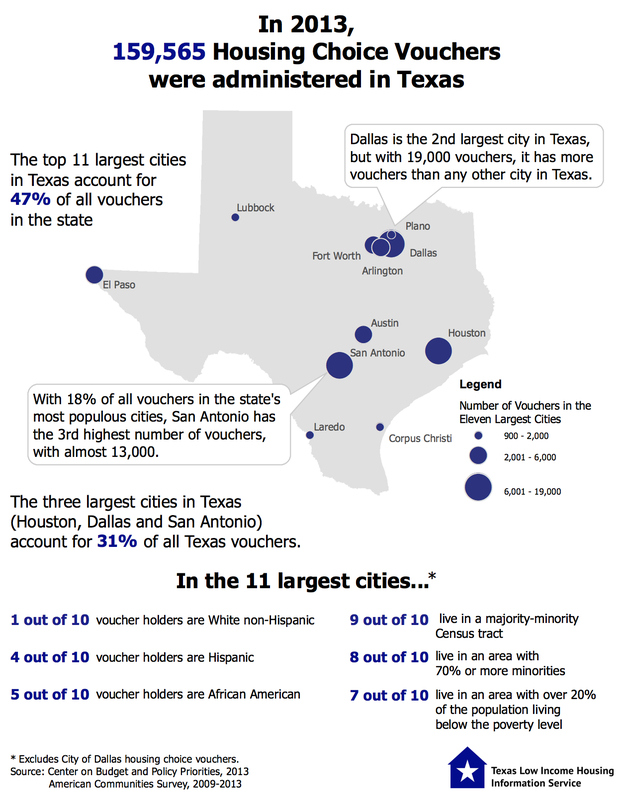 In the 11 largest cities in Texas, nine out of 10 voucher holders are non-white and nine in 10 live in a majority-minority Census tract, with seven in 10 living in a neighborhood defined by the federal government as a “poverty area.” Those areas almost always have lower performing schools, less access to good jobs, more crime, more environmental hazards and many more disadvantages than higher opportunity areas where voucher holders, until now, have mostly been kept out. The right to choose where to live. The right to stay in a neighborhood and not be displaced by gentrification. The right to equal treatment for all neighborhoods in terms of public infrastructure and services. The right to have a say in government action that impacts an individual and their neighborhood. The right to choose where to live is the most critical component of fair housing laws. The concentration of housing vouchers in isolated, low opportunity areas perpetuates racial segregation and compounds the effects of poverty. The Inclusive Communities Project (ICP) in Dallas has been leading the way on this issue, helping more than 3,000 families move to a higher opportunity neighborhood since 2005 through their Mobility Assistance Program. That program has only been possible because ICP sued HUD about the use of Fair Market Rents in the voucher program, successfully arguing that the program ran counter to fair housing by racially concentrating voucher holders. The suit resulted in a SAFMR demonstration program in the Dallas area, enabling thousands of ICP clients to move into areas that they otherwise would not have been able to afford. Now, if the proposed rule chance is enacted, voucher holders in 30 more urban areas around the country will have the same chance. The program has worked in Dallas: Those moving with vouchers now live in areas with less poverty and far lower crime rates, even as voucher costs for the city have fallen due to a better balancing of rent levels. And the fears of those who predicted the demonstration program would drastically reduce the number of housing vouchers available have been shown to be unjustified. Indeed, another benefit of SAFMRs is reduced waste in the voucher program – less taxpayer subsidy will go toward slum landlords in low income areas, who too often pocket the difference between their area’s actual market rent and the inflated Fair Market Rent of a voucher, without making any improvements to the housing conditions of their tenants. We believe that this rule change will also combat the spread of gentrification. Traditionally low income, majority-minority communities undergoing rapid demographic shifts typically see precipitous increases in rent, leaving many residents, especially those with set voucher levels, unable to afford their housing. By adjusting each zip code’s voucher level to keep up with its SAFMR, HUD can ensure that voucher holders can continue to afford to live in gentrifying neighborhoods – which in itself slows the process of gentrification and preserves neighborhood diversity. Research makes clear that the goals of fair housing – to give everyone the chance to live in a safe, decent and equitable neighborhood of their choosing – create inclusive communities and provide real, tangible, life-changing benefits. Demetria McCain, ICP’s president, has seen what mobility means for families in Dallas. This entry was posted in National issues and tagged Fair housing, HUD, SAFMR, Section 8, Vouchers. Bookmark the permalink. A builder of The Beloved Community passes – who’s gonna fill her shoes? Please post outcome as soon as decision is reached.